Tuesday, April 12th, 2011 at 10:45am. February 2011 real estate sales in the Sarasota area were up 24.2% from January and up 27% to 673 from February, 2010’s total of 528 sales. There were 472 single family home and 201 condo closings reported by the Sarasota Association of Realtors reported for February. 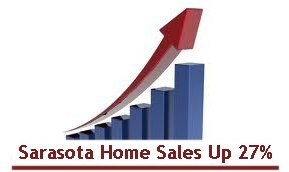 In addition to the positive home and condominium sales figures, pending sales (those under contract, but not yet closed) also registered above the 1,000 level in February, with 1,023 total properties going under contract following the 1,013 under contract in January. Both of these numbers are well above the 967 homes under contract in February, 2010 when sales volumes were being driven by the Federal home buyer tax credit program.